Venture into the lively streets of Kathmandu, spend a night at a Buddhist monastery guesthouse, and take in astounding views of the Himalaya in Pokhara: these are just a few of the experiences that await on this 10-day journey through Nepal. From the famous rhinos and Bengal tigers of Chitwan National Park to the ancient temples of the Kathmandu Valley, encounter the essence of the Himalaya. Greater exploration, insider access, and the freedom to roam – all without sacrificing comfort. Small group experience; Max 15, avg 12. Arrive any time. Arrival transfer included. After our welcome meeting, enjoy a six-course dinner of organic Nepali cuisine. Arrive at the joining point hotel at any time on Day 1 as no group activities are planned except for a group meeting in the early evening. Enjoy a six-course welcome dinner at Krishnarpan Restaurant, a culinary journey through the cuisine of Nepal. Serving some of the finest of Nepali flavours, enjoy this slow dining experience reminiscent of the ritual feasts enjoyed by the Kathmandu Valley's Newari community. The hotel listed below is an example of the hotel you will be staying at. For your departure’s start hotel, please check your voucher or the G Adventures App. Spend the day exploring Kathmandu and surrounding areas, including Boudhanath Stupa, one of the world's largest Buddhist shrines. Also visit the Royal City of Bhaktapur, exploring Hindu temples, pagodas and monuments, including the stunning wood-carved palace in Durbar Square. After, visit the Sisterhood of Survivors Project and learn how to make Nepalese momos (dumplings) before enjoying an authentic local lunch and lecture with one of the women who have graduated from the Sasane paralegal program. Enjoy a visit to the Bodhnath Stupa, one of the largest Buddhist stupas in the world. Built in the 5th century, this UNESCO World Heritage site still attracts many pilgrims, particularly Tibetan Buddhists and local Nepalis. Take in the peaceful atmosphere and observe Buddhist monks in prayer in the monasteries surrounding the stupa. Visit this unique old town known as the City of Devotees. Explore Hindu temples, pagodas, palaces, and monuments, including the beautiful wood-carved palace in Durbar Square. You can pick up clay pots and other souvenirs in the colourful open markets and taste home made yogourt, known as khopa dhau, which Bhaktapur is famous for. Visit this G Adventures-supported grassroots organization that is helping to support rehabilitated survivors of human-trafficking. SASANE, our project partners, train women coming out of trafficking to be certified paralegals, so that they are the first point of contact for other women coming out of abuse. Where survivors lack a high school diploma, the minimum requirements to be a paralegal, Planeterra and G Adventures have helped catalyze a hospitality program for these women to be reintegrated into a dignified work environment. The survivors will teach you how to make momos (traditional dumplings) as well as a Nepali lunch. The program helps support SASANE's outreach and education programs, and is completely run by survivors of trafficking. Enjoy a talk with a woman who has graduated from the SASANE program, which trains victims of human trafficking to be paralegals who, in turn, fight trafficking. Gain valuable insight and learn about the struggles these brave women face in helping others in their new roles as paralegals. Opt to take an early morning Everest experience flight, then visit ancient Swayambhunath Buddhist temple, a UNESCO World Heritage Site and one of the holiest shrines in Kathmandu. Then, visit a local home to learn about National Geographic grantee Chhing Lhomi, who works to preserve ancient weaving traditions of the Upper Mustang region through the Himalayan Indigenous Society. Depart the city to Pharping for a unique overnight stay at a Buddhist Monastery guesthouse. Learn about life in the Monastery from the inside, enjoying a chanting and prayer service. Opt to walk in the surrounding Village and countryside. Visit Swayambhunath Buddhist temple and Unesco World Heritage Site, the the most ancient and enigmatic of all the holy shrines in Kathmandu. Explore the structure and be sure to check out the Buddha's eyes painted on each side of the Stupa. The site is also known as the monkey temple, for the vast amount of creatures who call the complex home. In Kathmandu, National Geographic grantee Chhing Lhomi works to preserve the ancient traditions of the Lowa community of the Upper Mustang region. We'll take the unique opportunity to visit a local home of a family from this region and enjoy a lecture from Chhing or one of her colleagues on traditional weaving methods, and hear about ongoing efforts with the Himalyan Indigenous Society. Experience the serenity of a Buddhist monastery. The monastery guest house offers comfortable accommodations in a peaceful setting with balconies and private western-style bathrooms. Opt to participate in the life of the monks: take tea alongside them and enjoy the early morning chanting before experiencing the sunrise from the roof of this stunning monastery. There are approximately 200 young monks in residence, training in the Nyingmapa tradition. This is a new monastery (2006), and income from the guesthouse directly supports it. Get a close look at awesome Mt. 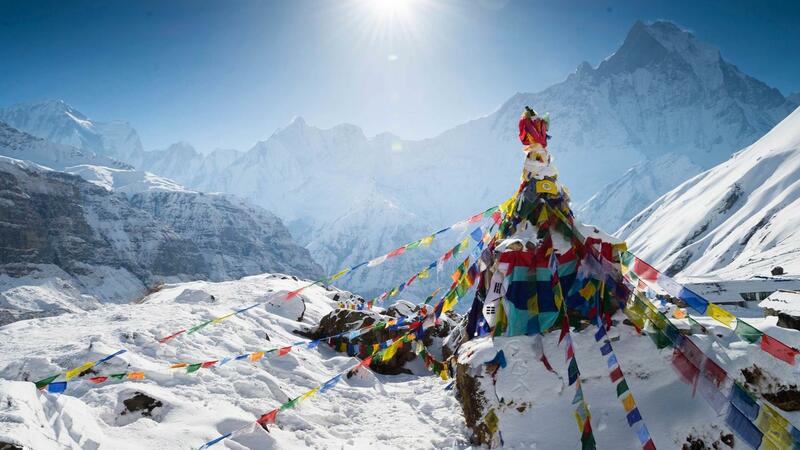 Everest, the highest mountain in the world, without having to do any climbing; this one-hour plane tour will give you an unforgettable experience. Rise early and enjoy the morning chanting and sunrise from the Monastery. After, drive to Kurintar and hike to our remote lodge on the banks of Trishuli River and valley. Opt to relax and enjoy the pool or take a hike in the surrounding countryside. Rise before sunrise and enter the main hall of the Monastery to listen to the monks practicing their chanting. After, we enjoy the sunrise over the Valley from the Monastery roof. Lace up your shoes and get to the next stop under your own power. Take a guided walk through the forests that cascade down the hillsides of Kurintar. Visit local villages inhabited by tribal people: Chepang, Dorai, Magar, some Brahman, and Chettri, making a living from foraging in the forests. Drive to our lodge located on the bank of the Rapti river which boarders the UNESCO World Heritage site of Chitwan National Park. After lunch enjoy wildlife viewing from traditional boats along the river. Embark in traditional patela boats on a silent trip down the Rapti River, which boarders the National Park to view aquatic birds, crocodiles, gharials, and the animals along the river banks. Explore Chitwan National Park with expert local guides. Activities can include a village walk, boating, nature walks, and jeep safari in search of rhinos, leopards, wild elephants, monkeys, and crocodiles. Also meet with a local tiger “technician” who will give a presentation about Nepal Tiger Trust, a nonprofit organization dedicated to the protection of tigers in Nepal. Our expert will join us on a jeep safari to teach us how tigers are tracked, protected and monitored, with help from the local community. If we’re lucky, we may catch a glimpse of one of these elusive great cats. This evening, return to the lodge and enjoy a Tharu cultural dance program presented by local Villagers. Enjoy a jeep safari that begins in open grassland and moves into the dense Sal Forest, crossing the Reu River to see different wildlife. Continue down to the banks of Narayani River and spot gharials (freshwater alligators) basking in the sun. Also, view wildlife from Bhimle Machan (a wooden platform). Enjoy a visit to the farming Village bordering the National Park. Learn about the social and cultural aspects of the village people, what the farm and see how they live day-to-day. Nepal Tiger Trust is a nonprofit organization dedicated to the protection of tigers in Nepal and is run by researchers and local community volunteers. Their Tiger Corridors Project has been monitoring these amazing cats in Chitwan National Park and adjacent areas for over five years. On this experience, meet with a local tiger “technician” who will give a presentation about the work here and its importance to conservation, tourism, and the community at large. He or she will then join us on a jeep safari to teach us how tigers are tracked and monitored. If we’re lucky, we’ll catch a glimpse of an elusive tiger. Drive to beautiful Pokhara and immerse yourself in stunning views of the Himalayas. Enjoy an orientation walk with the CEO and opt to have dinner at one of the popular restaurants in town. Enjoy a brief walk with your CEO. He/she will give you some tips on finding things like supermarkets, main squares, and ATMs. For more specific or in-depth information, an official guided tour is recommended. 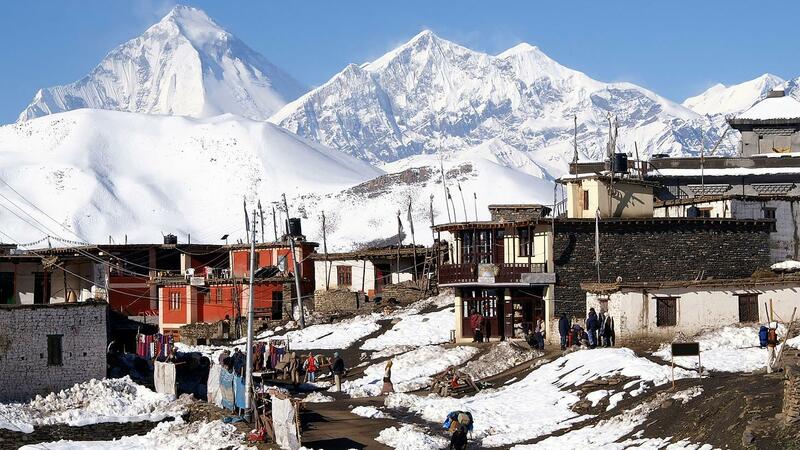 Hike up to Sarangkot and enjoy the sunrise and sweeping Annapurna Himalayan views. Later hike to the brilliant World Peace Pagoda, a stunning monument built by Buddhist monks from Japan. After, visit a Tibetan refugee settlement to learn more about this community, visit their photo gallery and enjoy a local Tibetan lunch. 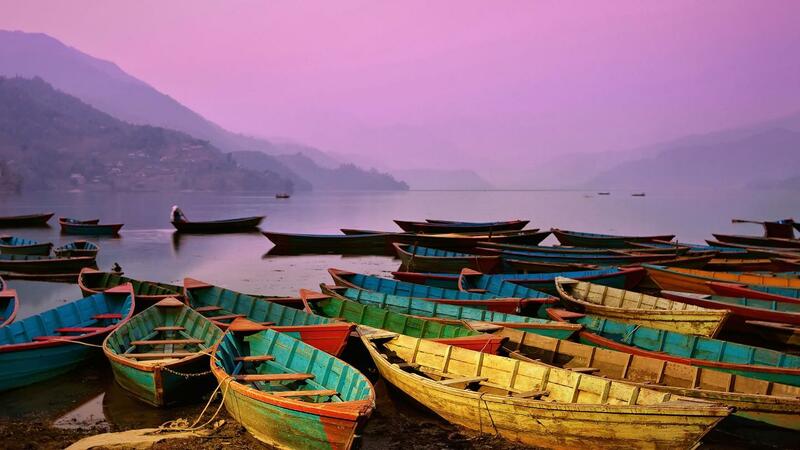 This afternoon, opt to try paragliding or go boating in Phewa Lake. Rise early and experience a spectacular sunrise view of the surrounding the Annapurna Himalayas. Walk up to the World Peace Pagoda, which was constructed by Buddhist monks. Enjoy the structure and the beautiful view around it. Visit the Tashiling Tibetan Refugee Camp, established by the United Nations in 1964 as a temporary settlement for the large number of refugees fleeing Tibet. Walk through this friendly quarter, now home to over 500 people. Visit the celebrated photo gallery here and then enjoy a traditional momo lunch at the local restaurant to support this incredible community. Enjoy a boat ride on Phewa Lake and take in the serene environment and natural beauty, including the magnificent fish-tailed summit of Machhapuchhre (6,977m, 22,890 ft) rising behind it. Catch a flight back to the capital, Kathmandu. Enjoy free time for shopping or opt to visit the Pashupatinath Ghats. Look! Up in the sky! It's a bird! It's a plane! It's... yup, it is a plane, actually. Take some time to explore on your own or do some last minute shopping. Visit Pashupatinath, one of the most sacred Hindu temple complexes in Nepal. Located on the banks of the Bagmati River, this is the final stop for many Hindus, who's families bring them here to set funeral pyres on the ghats to cremate their loved ones. Respectful viewing from across the river is culturally acceptable, you also will see sadhus (Hindu holy men) and pilgrims perform bathing rituals. Hotels (8 nts), monastery guesthouse (1 nt). 9 breakfasts, 4 lunches, 4 dinners. Private bus, plane, boat, walking, 4x4. Group trips average 12 travellers per departure, depending on the adventure. The maximum is usually no more than 16, but some can be smaller or bigger, depending on the trip. Check individual trips for details. G Adventures for Good: Sisterhood of Survivors Project, Kathmandu. Arrival transfer. 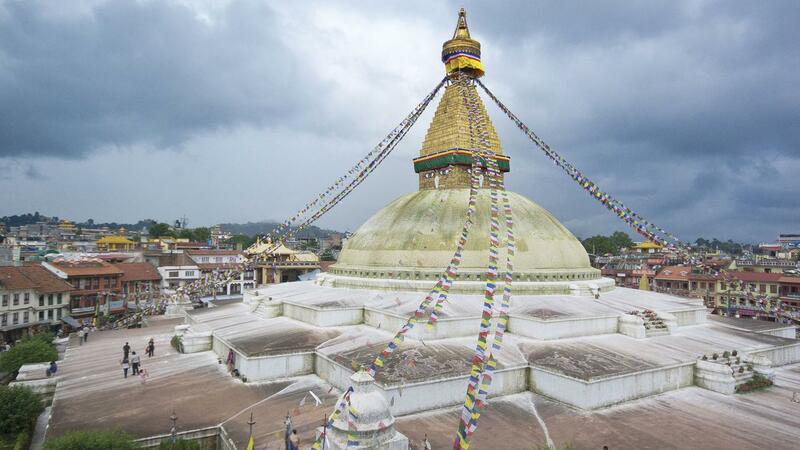 Visit Boudhanath Stupa and the Royal City of Bhaktapur. Visit Swayambhunath. Chitwan National Park including a village walking tour and jeep safari. Hike to the World Peace Pagoda. All transport between destinations and to/from included activities. Experience the essence of serenity with an overnight stay at a Buddhist Monastery, meet a graduate of the G Adventures-supported paralegal program for women, search out rhino in Chitwan National Park, get a firsthand demonstration of traditional apron weaving, learn how to make Nepalese momos (dumplings). Weather conditions in the Himalayas can change rapidly and our CEO may be forced to change the trip itinerary accordingly. Travellers need to be prepared for all weather conditions. For more information please read the "what to take" section of this trip notes. All G Adventures group trips are accompanied by one of our Chief Experience Officers (CEO). The aim of the CEO is to take the hassle out of your travels and to help you have the best trip possible. They will provide information on the places you are travelling through, offer suggestions for things to do and see, recommend great local eating venues and introduce you to our local friends. While not being guides in the traditional sense you can expect them to have a broad general knowledge of the countries visited on the trip, including historical, cultural, religious and social aspects. We also use local guides where we think more specific knowledge will add to the enjoyment of the places we are visiting - we think it's the best of both worlds. We don't expect any problems, and nor should you, but if for any reason you are unable to commence your trip as scheduled, as soon as possible please contact your starting point hotel, requesting that you speak to or leave a message for your CEO (if you are not on a group tour please refer to the emergency contact details provided in this dossier). If you are unable to get in touch with your CEO, please refer to our emergency contact details. If you have pre-booked an airport transfer and have not made contact with our representative within 30 minutes of clearing customs and immigration, we recommend that you make your own way to the Starting Point hotel, following the Joining Instructions. Please apply to your travel agent on your return for a refund of the transfer cost if this occurs. We suggest that you pack as lightly as possible as you are expected to carry your own luggage. As a rule we try not to have to walk more than 15-20 minutes with your bags which is why we recommend keeping the weight of your bags between 10-15kg/22-30lb. We recommended a backpack or soft case/duffle on wheels of small to medium size (no XXL ones please!). You will also need a day pack/bag to carry water, cameras and other electronics like ipods and mobile phones. As currency exchange rates in Asia fluctuate often we ask that you refer to the following website for daily exchange rates: www.xe.com As of Feb 2012 the exchange rate for NEPAL was 1 USD = 78.76 NPR (Nepalese Rupees). There are many ATM machines that accept both Visa and Mastercard but these are limited to major cities. Major credit cards are accepted in most shops but they may charge a 2-4% transaction fee. It is customary in Asia to tip service providers such as waiters, at approximately 10%, depending on the service. Tipping is expected - though not compulsory - and shows an expression of satisfaction with the people who have assisted you on your tour. Although it may not be customary to you, it is of considerable significance to the people who will take care of you during your travels. There are several times during the trip where there is opportunity to tip the local guides or drivers we use. You may do this individually, or your CEO will offer to collect the money and tip as a group. Recommendations for tipping drivers and local guides would range from $1-$2 USD per person per day depending on the quality and length of the service. For porters during the trekking portion of your trip, the recommended amount is 300-500Rs (4-7USD) per porter per day; ask your CEO for specific recommendations based on the circumstances and culture. Also at the end of each trip if you felt your G Adventures CEO did an outstanding job, tipping is appreciated. The amount is entirely a personal preference, however as a guideline $20-30 USD per person, per week can be used. You should consult your doctor for up-to-date medical travel information well before departure. We recommend that you carry a First Aid kit and hand sanitizers / antibacterial wipes as well as any personal medical requirements. Please be aware that sometimes we are in remote areas and away from medical facilities, and for legal reasons our CEO are prohibited from administering any type of drug including headache tablets, antibiotics, etc. In Asia pharmacies tend to stock the same western drugs as you get at home but they are usually produced locally so please bring the full drug name with you when trying to purchase a prescription drug. When selecting your trip please carefully read the brochure and itinerary and assess your ability to cope with our style of travel. Please refer to the Physical ratings for trip specific information. G Adventures reserves the right to exclude any traveller from all or part of a trip without refund if in the reasonable opinion of our CEO they are unable to complete the itinerary without undue risk to themselves and/or the rest of the group. Many national governments provide a regularly updated advice service on safety issues involved with international travel. We recommend that you check your government's advice for their latest travel information before departure. We strongly recommend the use of a neck wallet or money belt while travelling, for the safe keeping of your passport, air tickets, travellers' cheques, cash and other valuable items. Leave your valuable jewellery at home - you won't need it while travelling. Many of the hotels we use have safety deposit boxes, which is the most secure way of storing your valuables. A lock is recommended for securing your luggage. When travelling on a group trip, please note that your CEO has the authority to amend or cancel any part of the trip itinerary if it is deemed necessary due to safety concerns. Your CEO will accompany you on all included activities. During your trip you will have some free time to pursue your own interests, relax and take it easy or explore at your leisure. While your CEO will assist you with options available in a given location please note that any optional activities you undertake are not part of your itinerary, and we offer no representations about the safety of the activity or the standard of the operators running them. Please use your own good judgment when selecting an activity in your free time. Although the cities visited on tour are generally safe during the day, there can be risks to wandering throughout any major city at night. It is our recommendation to stay in small groups and to take taxis to and from restaurants, or during night time excursions. Our small group adventures bring together people of all ages. It is very important you are aware that, as a minimum, an average level of fitness and mobility' is required to undertake our easiest programs. Travellers must be able to walk without the aid of another person, climb 3-4 flights of stairs, step on and off small boats, and carry their own luggage at a minimum. Travellers with a pre-existing medical condition are required to complete a short medical questionnaire, which must be signed by their physician. This is to ensure that travellers have the necessary fitness and mobility to comfortably complete their chosen trip. While our CEOs work hard to ensure that all our travellers are catered for equally, it is not their responsibility to help individuals who cannot complete the day's activities unaided. Please refer to the physical ratings in this Trip Details document for more information. In Asia the dress standard is more conservative than it is back home. When packing try to pick loose, lightweight, long clothing that will keep you cool if its hot and can be layered when cool. In predominately Buddhist, Hindu and Muslim countries we ask that you dress respectfully and avoid short shorts/skirts and singlets/tanktops when visiting temples or mosques or other holy sites. Eating is a big part of traveling. Travelling with G Adventures you experience the vast array of wonderful food that is available out in the world. Generally meals are not included in the trip price when there is a choice of eating options, to give you the maximum flexibility in deciding where, what and with whom to eat. It also gives you more budgeting flexibility, though generally food is cheap. Our groups tend to eat together to enable you to taste a larger variety of dishes and enjoy each other's company. There is no obligation to do this though. Your CEO will be able to suggest favourite restaurants during your trip. Included breakfasts will usually be asian style consisting of noodles or congee (rice porridge) or bread and eggs. Vegetarians will be able to find a range of different foods, although in some areas the choice maybe limited. While trekking in remote regions food is included, plentiful and made of fresh local ingredients.